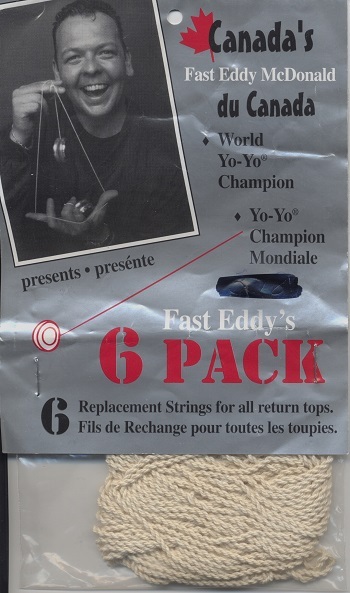 Fast Eddy's 6 pack of 100% Egyptian cotton replacement strings for all yo-yos... er, I mean return tops. These were made in Mexico for Jack Russell Yo-Yos and rebranded for distribution in Canada by Touch the Sky, Inc. out of Toronto and Vancouver. Back of the package has a very short bio on Eddie McDonald. The string pack mentions to ask your retailer for the [Jack Russell] Fast Eddy Shooter.